We're really happy to welcome ever more trivia gamers to Quizcover and to see in our statistics that the average number of questions played per user per day is in the 40-50 range! That is definitely more than we expected and speaks to the game's addictiveness. Some people believe there are mistakes in our questions only because of a misunderstanding of how PickSome scoring works. We'll change the game to avoid those misconceptions going forward. 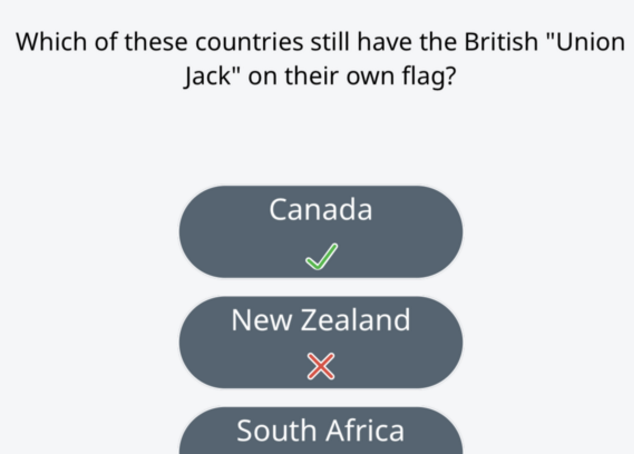 "Which of these countries still have the British 'Union Jack' on their own flag?" The countries listed are Canada, New Zealand, South Africa, Australia, and Ireland. Tow of them do: Australia and New Zealand. The other three don't. As the related Wikia page explains, the rule is that you get points for each item that you correctly select (such as for selecting Australia or New Zealand) and--which we're going to change--the ones you correctly don't select. For example, not selecting Canada also earns you points so far (January 20), and the idea was that your decision not to select it was a correct one, so it should be rewarded. After all, we must deduct points if you selected something you shouldn't have selected, or if you didn't select something though you should have. So it seemed far that you also got two chances to earn points: by selecting (where appropriate), and by not selecting (where appropriate). The part that people usually understood was the red X on "New Zealand": New Zealand's flag does sport the "Union Jack" in the upper left corner, so a failure to select New Zealand is undoubtedly a mistake. The scorecards explain the four different PickSome scenarios: correct orange items; incorrect orange items; correct gray items; and incorrect gray items. But clarity and intuitiveness are of the essence, so we're just going to change this aspect of our game. Gray buttons that are correctly left gray won't earn you points, and they won't get checkmarks or any other symbol. They'll just fade out. Most of our efforts these days are going into the multiplayer part. The most recent change we made is that you can now play all of your 12 duel questions in a row without having to wait for your opponent. In a forthcoming update, you'll have to hit a button on the home screen and you'll be off playing a random duel. You'll get to start even before your opponent has been found. We know that some people who really like to play Quizcover against others felt that the feature was almost hidden. Very soon it's going to get prominent exposure. Knowledge is more playable than ever: on top of the traditional "Pick One" question type, Quizcover comes with the new, more interactive and more flexible "Pick Some" and "Match Two" types, and integrates this level of diversity into a rich framework of contests and challenges. what kinds of help players can get from boosters. True to its slogan ("Fun time well spent. "), Quizcover also has something to offer to those players who are keenly interested in acquiring knowledge along the way or whose curiosity is sparked by a name or term that comes up in the game: info texts that appear after questions, and bookmarkable links (typically several links per question). "Quizcover is a whole new experience for those of us who like to play with facts and knowledge but dislike the monotony of old-fashioned trivia games," said Florian Mueller, Quizista's founder and CEO. "From the outset we wanted to redefine the genre and revolutionize our microcosm the way the iPhone did in its infinitely larger field ten years ago." Mueller is named in the credits of three of the most successful computer game franchises in history: Warcraft, Starcraft, and Diablo. He is also known to many in the iOS community by virtue of his FOSS Patents blog, which covers intellectual property, antitrust and policy matters involving Apple and other mobile device makers. At this stage, Quizcover's content is primarily tailored to a U.S. audience and people around the globe with a strong interest in everything American. Over time, users in different regions of the world will see different selections of content. Quizcover is a free-to-play app. Premium offerings are optionally available: real-world money can be converted into in-game coins and then be spent on boosters, retries, or skips. Avid gamers can also take a VIP subscription (one free booster per question) and/or Second Chance subscription (one free retry per question). The game also provides free boosters to users as part of its tutorial, for reaching higher levels, and as a reward for inviting friends or visiting the game's Facebook, Instagram and Twitter pages. Quizista invented the customer-friendly Booster Back mechanism (see www.boosterback.com), which ensures that Quizcover users get an immediate booster refund if they fail to score on a question despite having used boosters. They can then use those boosters on other questions. Quizista would like to encourage other game makers to adopt the same approach.